Two of the great enemies of any long-running series author are Zeerust and Comic Book Time. As elucidated by TVTropes, Zeerust refers to technological references that are rendered quaint and outdated by real technological advance. Comic Book Time refers to the way characters don’t age as quickly as time passes in the real world. Both of these were a problem for Diane Duane’s Young Wizards series, one of the all-time great young-adult series (and my own personal reason, by their complete absence from it, for why NPR’s top-100 list is so very, very full of it), especially the first three books written in the eighties. If one goes back and reads the original versions now, the Zeerust abounds—in one particularly amusing example, a super-powerful techno-mage computer is based on an Apple III. And by the characters’ personal timelines from later books, the events in those books should have happened just a handful of years ago. This was getting in the way of getting new readers interested in the ongoing series. So Diane Duane had a novel idea: she has gone back through early books and polished and revised them to bring the technology and recent history current and consistent with the present-day, retconning the series to have started taking place in 2008. 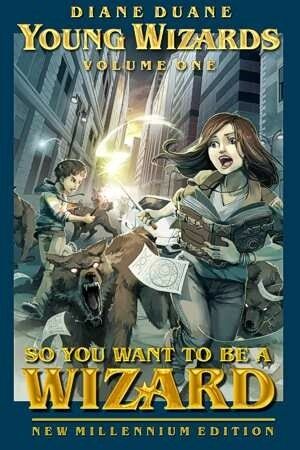 The first revised book in the series, the New Millennium Edition of So You Want to Be a Wizard, is now available from her e-book store at a list price of $6.99, DRM-free and in a variety of formats. Apart from the technology updates, it also includes some entirely new material generated over the course of story treatments for various screenplay proposals. The question of whether and how to update older stories for newer time periods is an interesting one. Duane’s problem isn’t exactly uncommon; it faces the authors of any long-running series (be it of books, television, movies, etc.) that is supposed to be set in “the present-day.” Some of them deal with it by ignoring it, but this generally only works for things like movies and TV series where the present iteration is consumed without much reference to prior versions. Printed matter has it harder. Jerry Ahern’s The Survivalist series (some of the earliest commercial e-books I read) started during the height of the cold war, then moved forward into post-holocaust science fiction, but by the time it wrapped after nearly 30 books the Soviet Union had long ceased to be any kind of threat at all. But relatively few authors seem concerned about revising and rewriting earlier books in series. About the only other one I’ve become aware of to it was F. Paul Wilson, who rewrote his first Repairman Jack novel to be more consistent with the other entries in the series written almost 20 years later. Regardless, I hope and expect the newly-revised book will spark some much-deserved interest in Duane’s series, and discussion among readers as to which version is “better” and how well the changes do or do not work. And sooner or later I will be taking part in it myself. Marion Zimmer Bradley rewrote her early Sword of Aldones into the waaayyy better Heritage of Hastur but it was more a matter of having 20 years more experience as a writer than a need to realign the story. As a bookseller, I look forward to selling the revised editions… but will probably go buy the digital editions for myself, too. I’ve been a huge fan since reading the first book when it came out.